The Minister of Education, H E Mom Luang Pin Malakul, once opined to the Director-General of the Vocational Education Commission that Thailand had a severe shortage of coordinators or liaisons between engineers and skilled labors, and that back in 1957 it took 6 years to produce a vocational technician. That is, a student who graduated from Grade 9 in secondary school must continue his education in industrial technology for 3 years in order to receive a vocational degree. After that, the student needed to work or continue his study at a technical institute for 3 more years to earn a diploma degree. Only then could he become an industrial technician. What do we do to expedite the search for such coordinators between engineers and skill labors ? During the search for an ideal location to establish an institution, the Director-General Sanan Sumitr discovered that there was a piece of 32-rai land at Tambon Bangmod, Amphur Ratchburana, Thonburi Province and owned by the Crown Property Bureau had been rented by the Ministry of Education. The property consisted of a standard two-story building with 14 classrooms, housing for the faculty, and a small cafeteria, that had been completed since 1958. All the premises were vacant despite the availability of electricity, tap water, telephone lines, which meant that the property could be immediately utilized. As a result, the Director-General proposed that the property be the location of a new institution called “Thonburi College of Technology”. The Ministry of Education officially announced the establishment of “Thonburi College of Technology” on February 4, 1960. The College accepted students with degrees from secondary schools (equivalent to today’s Grade 12) only in the field of sciences, who would continue 3 more years of education to earn a diploma degree. That makes Thonburi College of Technology the first technological college in Thailand responsible for producing industrial technicians with the highest degrees in secondary schooling. The Vocational Education Commission then appointed Mr. Prapha Prajaksuphaniti, first professor and head of the Civil Engineering Department, Faculty of Technology, from Siam Institute of Technology as the Director of the new college. Moreover, the commission granted the permission to Mr. Prapha Prajaksuphaniti to bring with him 6 colleagues to join the new college, namely Mr. Sompong Panyasuk, Ms. Ubon Chantakamol, Mr. Uthai Kaewchuang, Mr. Sutham Tawitsri, Mr. Tanong Ruengrojdee, and Mr. Etisak Thongkam. Prof. Sanan Sumitr, the Director-General of the Vocational Education Commission, found the light he was searching for and proposed that a new technological college be established under the supervision of Vocational Education Commission in order to quickly fulfill the government’s needs for more technicians. Students with high school diplomas in sciences would be accepted into the college and continued 3 years education. The Ministry of Education approved this project in November 1959. King Mongkut’s University of Technology Thonburi was founded from Thonburi College of Technology which was under the supervision of the Vocational Education Commission, the Ministry of Education on February 4, 1960. In 1971, Thonburi College of Technology was merged with North Bangkok College of Technology and College of Telecommunication Technology to become King Mongkut’s Institute of Technology Thonburi (KMITT) under the supervision of the Ministry of Education. After that, in 1974 the Institute was upgraded into a state academic institution under the Ministry of University Affairs. In 1986, KMITT became a juristic entity within the Ministry of University Affairs under a royal decree for King Mongkut’s Institute of Technology Lakrabang, King Mongkut’s Institute of Technology Thonburi, and King Monkut’s Institute of Technology North Bangkok. King Mongkut’s University of Technology Thonburi, by a royal decree in the year 1998, was changed into a state juristic university outside the civil service system but is still under the supervision of the government. The status change was officially declared in the Royal Gazette Volume 115, Section 11 ก on April 4, 1998 and was made effective on March 7, 1998. 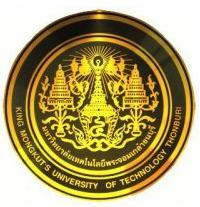 King Mongkut ‘s University of Technology Thonburi realizes that our personnel are the most invaluable resource. Our human resources comprise students, instructions, officials, and former students; all of them take part in contributing to the University’s work, success, reputation, and future. Establish the need for searching for knowledge into students through self-study and lifelong study from the years they are university students until the become workers of any vocational fields. Promote instructors and researchers to continuously quest for knowledge and experience in order to be academically dynamic. Develop the executives and officials in order to be able to perform their duty qualitatively and efficiently. Establish a system aided to learning, intellectual mobilization, and exchange of experience. King Mongkut’s University of Technology Thonburi intends to play a leading role in research study, development and selection of technology appropriate to Thai economic and social contexts, and in helping Thai community to be peaceful and to have competitive capability. The University will try to establish the understanding within society about the benefit and effect of technology to life and society, including the intellectual control of technology for environmental preservation and permanent development. As a result, the University will promote and support a research study, a beneficial use of the re3search, a provision of academic services to society, including an establishment of interaction with other universities, institutes, private schools and communities. King Mongkut’s University of Technology Thonburi intends to train our students to have a profoundly and broadly academic background, a logical thinking process, a proficiency in Thai language plus at least one foreign language, and an expertise in technology especially in Information Technology. Students will be educated to have a faith in ethic and morality, to behave morally, to maintain occupational ethics, to have discipline, to realize their duty, to have a responsibility, and to be interested in and open-minded about new-coming knowledge. The University determines to continuously develop the educational system and educational quality assurance system, which include an integration of additional learning activities, social skills, culture, morality, and academic study. Because of the support from the government and the acceptance from society we have received, King Mongkut’s University of Technology Thonburi realizes that we must perform our duty as extremely well as we can. We know that our reputation and honour come from working efficiently, hard and cleverly, having an effort, being a good citizen of society, and having proper behaviour from our students, instructors, officials, and former students. The reputation and honour as a result of co-operation from all university community members would bring the pride to us and to every part of the communities associated with the University. King Mongkut’s University of Technology Thonburi will develop itself into a world-class university in terms of the quality of graduates, the personnel’s knowledge and capability, superb academic works, an expertise in technology, research effectiveness, and having qualitative and efficient administration system. To apply principle and scientific procedure to teaching-learning management while nice atmosphere and environment are designed to promote the learning, to help the human resources developing their systematic and rational thinking as well as connecting to the knowledgebase-construct relationship that contributes to working and living solutions. To develop the human resources’ potential to be capable to apply the idea of management to increase a systematic effectiveness to work environment, to be able to analyze the conditions that impact working as well as to develop them to have an effectively administrative capability. To develop the best and the brighten graduates who are physically and mentally absolute, are able to survive in Thai society, are academically excellent, have a virtue, are happy, yearn to learn and acquire skills to gain knowledge, learn to create and develop, are capable in thinking and doing, are well-adjusted to deal with a changeable society. Be the university that conducts research in science, technology and other related sciences in order to adopt new knowledgebase to support teaching and learning activities, academic services and develop a potential for competitiveness of Thailand. Be the University that applies the electronic media to support all academic activities such as teaching and learning activities, governance, research and all services which can be accessed anytime and anywhere as well as to facilitate a self learning. Be an organization that expands the competency and increases the potential to create continuous work and future while each members collaboratively and continuously learn with clear understanding, system thinking and public unity. Be the University that has an effective system of revenue driven and cost conscious which is transparent, accountable and a mutual standard criteria. The staff of the university is knowledgeable, understandable and aware of cost and revenue significance.